I was trying to read a current technical piece and realised I have totally lost touch with the jargon applying to phone use. Here I attempt to demystify that and in so doing present a short history of the mobile phone. That may turn into one of those pages I update each year (there are several such on this site, the apparent date of writing does not necessarily reflect the date of the last edit). A GSM cell phone (Global System for Mobile, but originally Groupe Spécial Mobile) requires a SIM card and that allows you to switch providers. GSM has been a Europe-wide common standard since some time in the 1980s (agreement does not mean signal coverage, patchy even in 2019). GSM functions in multiple frequency bands, typically 850, 900, 1800 and 1900 MHz. Data transfer can be GPRS, E, 3G, 4G or LTE. Do read the wikipedia article. My original iPhone (1st gen, 16Gb) was a GSM, 2G phone. CDMA (Code Division Multiple Access) is quite different from GSM. CDMA refers, confusingly, to a system of networks, each version of which was some sort of improvement (faster, more reliable, etc). CDMA is principally found in the USA and can be characterised by (i) using internal memory rather than the memory on a SIM card (ii) generally tied to a network, making (iii) roaming more difficult than GSM, (iv) being tied to just the 850MHz band and (v) offering 3G, 4G and LTE or EVDO for data transfer. A CDMA phone might well have a SIM card (too) if it is 4G or LTE. Hence some CDMA phones will work on GSM networks, wile generally the opposite is not true. My elderly iPhone 4 is a CDMA phone with a SIM card; it works on 3G. My 5S and the wife's 6 are both GSM and CDMA and are 4G phones. Early edition analogue mobile phones, sometimes called 'bricks', appeared in the 1980s. They did no more than act as phones, but the breakthrough was that they needed no landline. At the time we didn't even recognise landline as a term. Call this 1st generation. Around ten years later we started to see 2nd generation phones, so, added to the voice services (as we began to call that) was text messaging, that which we now call SMS [Short Message Service, 160 characters]. Explanations of letter combinations will appear as they become relevant. 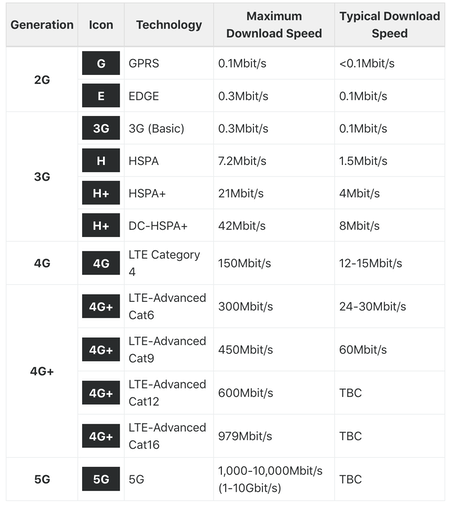 LTE, Long Term Evolution, is a (European) 4G standard. Only Three offers an LTE slot, at 3500 and 3700MHz. 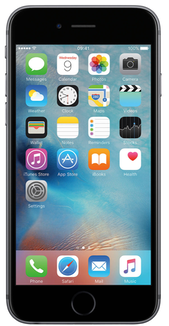 LTE is an upgrade from both GSM and CDMA. Different countries use different bands of frequency, so phones that work internationally must be multi-band. Plain LTE is 3.95G.while LTE Advanced is "true 4G". Care required, then. The LTE specification (wiki) provides downlink peak rates of 300 Mbps, uplink peak rates of 75 Mbps and QoS provisions permitting a transfer latency of less than 5 ms in the radio access network. LTE has the ability to manage fast-moving mobiles and supports multi-cast and broadcast streams. LTE supports scalable carrier bandwidths, from 1.4 MHz to 20 MHz and supports both frequency division duplexing (FDD) and time-division duplexing (TDD). Repeating the ten year cycle, CDMA 2000 is one of the standards implicit in a 3G Phone along with UMTS (and...). The remarkable upgrade element in going from 2G to 3G was data rates of around 1Mbps, what we subsequently called mobile broadband. LTE refers to 4G —and yes, around 2010—and another jump to around 100Mbps. 5G, maybe late 2019 but we'll call that 2020 onwards to keep the ten-year cycle going, looks to offer 1Gbps, another tenfold increase in data speed. The 4th generation jumped in speed yet again and provided many improvements that most of us never noticed. You might characterise this generation as the phone service, voice services, being but a minor facet of what the 'mobile' would do. Network systems such as WIMAX and LTE provide voice services via another service, VoIP. That secondary nature for voice services might well define the difference. Just to be clear: the n-G reference is to the telecommunications standard. So 1G was wireless telephone technology, mobile and analog telecommunications, while 2G onwards was digital telecommunications. GSM was first used in 1991 and by 2014 it was a world-wide standard (wikipedia). Quoting from that source, GSM Subscribers passed 10⁸ in 1998, 5x10⁸ in 2001 ad 10⁹ in 2004. Keen technical historians will want to place markers for 2.5G, 2.75G, 2.9G, 3.5G and 4.5G. Associate EDGE and GPRS with 2.5G and think of that as adding packet-switching technology, which meant that internet connection occurred. Of course, as the 90s went on, so more became available on the internet as we added data and with that the demand (for access to information) rocketed, which meant that data transfer needed to improve. That has not changed, so we can think of 4.5G as associating with HSPA, which moved data rate from 1 to 2Mbps. The 4.5G associates with the advances in LTE (literally, Advanced and Advanced Pro), which tale rates towards the magical gigabit per second. Data Speed: How do you measure it? What does it mean? Source  puts a version of 4G at 1Gbps and says user experienced rate is 10Mbps, 1% of peak. Source  also says peak 5G is (will be) 20Gbps not the 1-10 shown and says the user experience might well be 100Mbps, or 0.5%. I'm equating Quality of user Experience, QoE, with 'typical download speed'. Perhaps 1% of peak is about right, but that is not borne out by the history shown in the table. Indeed, the decay in performance is extreme, not even linear at log log. If it were linear at that transformation, we'd expect QoE to be 4% of peak. Perhaps the increased expected demand characterised by the 'internet of things' is an order of magnitude bigger than one had thought. 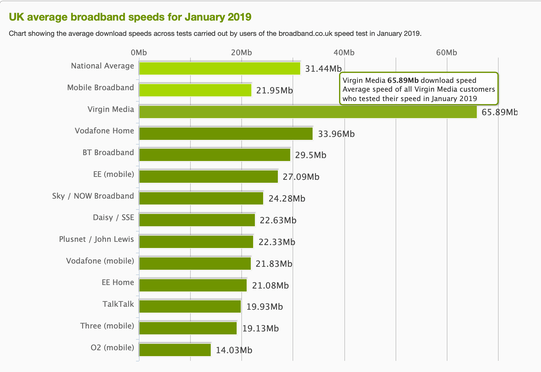 You check your download speed with a broadband checker — you know this, but have you tested what you get against the advertised peak? Have you any idea what is acceptable? How do you think that apparent degradation affects what your supplier is prepared to advertise? Do you simply decide from experience that <this> is fast enough or are you needing to adjust what you do based on the time of day (internet weather) or the length of time a download requires? Here's a display I found immediately, of what is actually experienced. I agree Virgin is wonderful, but can report it as money for speed in comparison with, say Plusnet. Approximately £60 per month for Virgin, £24 for P-net, so you pay for what you get. Look at Ofcom  for better history of this. We run up to 8 gadgets (yeah, just two of us) and notice issues only when both streaming video, which is very rare indeed. I see a bigger change near to five, when lots of people do the same something. Oh, as 'what is acceptable' has a very simple test: the moment you realise you are in any sense 'waiting for the system' is the moment you realise speed is an issue; quite how long you are prepared to wait before you throw money at the problem is a different issue, but I can tell you the mass of population has evidenced very little patience. Peak data rate, meaning maximum possible download speed, sometimes called downlink. I see confusion between this and the maximum an end-user could (but wouldn't) experience, which is lower still. There is clearly a need for a better number to advertise. Downlink, properly is the data transfer rate from the base station to the end-user. Uplink goes the other way. Range refers to the distance at which one can receive data at 25% of the typical rate. What you probably think of as wifi, the 80211n standard (not the .11nn) gives you perhaps 30-50 metres range. Quality of experience, the user-experienced data rate. How this increases with each generation might make a fun maths page. I think the gap between this speed and the advertised possible is a problem. Latency is the typical delay between the ends of a connection. High latency is a longer delay. Mobility is the speed at which the terminal may travel and maintain connection. I think; this was elusive to track down. Mobility on 4G may be as high as 350kmph and 5G might reach 500kmph. Whether this means something significant to air flights, I do not understand; I thought they managed to supply signal by using a satellite connection. I'm not terribly interested, so you can research that yourself. I did see in  that providing signal to moving objects causes a drop in data speed (obviously it does, but what is not obvious is how much). For 3G try dividing by 6. For 4G divide by 10. Energy efficiency is a reflection of the amount of energy used by networks. refers, but the numbers are an awful lot bigger than I was expecting — "telecommunications networks account for...37% of ICT usage". I didn't bother to read where that is true, I think Greece, but I use that single figure to point out that energy is a factor we should be aware of. says the next generation is generally more energy efficient, but doesn't confirm whether that is measured by area or by unit. Spectrum efficiency is using the bandwidth to send the maximum amount of data with the fewest transmission errors. Translated to a network, that means the maximum users per cell (tower, base unit) for acceptable quality of service. [9, p9] says this improved by a minimum of 20% in going from 3G to 4G and [9, p10] in practice a good deal better than that. However, I found a reference, p13, that says that the spectrum efficiency gains alone fall short of meeting the expected change in demand. No great surprise there; 4G doesn't require us to abandon 3G. Demand studies (p130 says annual growth is between 24 and 100% per year 2009-14). Therefore the outstanding capacity improvements to meet traffic increases will need to come from a combination of additional spectrum (in appropriate frequency bands with industry support) and topology (mainly from more numerous, smaller cells). 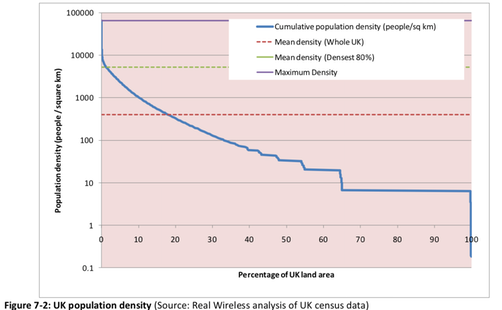 As implied by the reduced range with increases in speed, so the arrangement of cells (what in 2G and 3G terms we call towers) becomes far more important and there need to be many more such base stations. So the arrangement of these, the topology, becomes important (more important). I wonder if that means that high density sites will be well served because of perceived demand, making for elitist service? It could be that there is a limiting capacity to all arrangements, bringing us back to my idea of internet weather; not just having a signal but enough capacity for what you want to do — we're getting used to this, and continuing to demand ever more, quite possibly for no real gain. Air interface is the collective term for the hard-wired core consisting of a network of base-stations (cell towers) connected by fibre-optic links; and radio links between the towers and consumers’ devices  As I wrote this piece, it occurred to be more than once that, the 5G works on higher frequencies which means that transmitters must be closer together — which in turn means there needs to be an awfully large number of them, compared to 3G and 4G. I understand that they will be smaller, but the increase is of magnitudes (more than ten times, as soon as you think about area to cover, and volume in CBDs). Someone is going to make an awful lot of money out of this. I note especially that none of the suppliers are British. Do read all of  for pointers to what we have not yet recognised, but I think I've captured the essence. There is an implication I recognise as I re-read the whole page, that what we will see in all likelihood is a further differentiation between the biggest cities, London especially, and everywhere else. Which makes a strong case for complete coverage by 3G or 4G as soon as possible — it has been needed for some significant time.. We may simply see a difference between places with and without 5G, limited to a building or a company site. That will render the whole idea of universality useless, giving us something far more akin to a service area, a place where some functions can be enabled. That alone could have a dramatic effect on take-up, making it surprisingly selective. Wifi is short-range, tens of metres; 3G is a cell network. Wifi is faster than 3G, mostly because of traffic (users per supply point, basically); which means that, for example, wifi might well be slow in school, at the airport or train station, or at your favourite eatery. Wifi is much cheaper than 3G. 3G may be more reliable (less down-time, but you probably wouldn't notice. 3G will use up your battery faster than wifi but again you might not notice. On my iPhone I can choose between using wifi or 3G; neither is free, but the costs may well be buried in service charges. The big advantage to 3G is that, because it is cellular, you can move around and keep the connection. So my attitude is that I use wifi whenever I can and switch to 3G only when I must. Some would see these two technologies as competing. discusses this in a US context; you might decide that 2010 is so long ago this is a historical piece. will lead you to the article, Vol8 No5 2010 Int J Mobile Comms. Is an EDGE phone the same Edge as in edge computing? No, they are not the same. An EDGE phone network is an extension of GSM, Enhanced Date rates for GSM Evolution is the basis of the acronym, so at best an EDGE network is 2.75G. Edge computing is a model for distributed computing where the edge (not used as an acronym) is the outside edge of the network, in the sense of being all sorts of sensors or smart objects. Whether edge computing and the internet of things (IoT) each contain the other is debatable, but the wikipedia article suggests that one would better think of edge computing as more concerned with computation performed at the edge of networks and systems whereas the Internet of Things label implies a stronger focus on data collection and communication over networks. Homework suggestions: (i) describe the four industrial revolutions (ii) distinguish between cloud, fog and edge computing. Can I identify what is on a tower, down to whose network it is? Not any longer. You should be able to distinguish tv, radio, phone, microwave and so on, though. The straight antennas, often in multiple sets are radio (panel or rectangular) — this is your mobile phone and the tower is the base station. The round antennas that most of us would call dishes, communicate between towers (lines, rings, whatever it is in the network) and are (therefore?) microwave antennas. Generally, the smaller the antenna, the shorter the wavelength, so you could recognise the old long panel antennae as 2G. For a similar reason, the 3G will probably big seen as more multiples in a set. What generation is my phone? A better question might be "What generation is my phone using?" Go to Settings/Mobile Data/Options or Settings/Networks/ Mode and look. Apparently my phone is using "4G Voice". Since I hardly use my phone for anything more than text and I have most phone facilities turned OFF, I am unaware what that means, even in terms of usage. I am sure that the phone tries to find a functioning signal from whatever it can discover. I am also sure that this means any calls received while up a mountain are almost guaranteed to be thanks to a 2G system. You only notice or care when something you want to do goes slower than you expected. I hope this helps a little. I spent most of three days floundering around to discover this much. I suppose really I discovered what I didn't know — far too much. It is only recently that I began to understand what the FaceTime bug was all about — that it was not at all hard to trigger your phone to pass what the camera was 'seeing' without the user/owner being aware that the camera was even 'on', let alone transmitting pictures to an unknown party. Cue many of those quotes abut magic being indistinguishable from technology one doesn't understand. It can only get worse. I wonder, in consequence, what we can do to make use of such wonderful stuff and do so safely. Where I recognise that both 'use' and 'safe' are mutable conditions. We need to continually question whether what is on offer is of use to us as individuals. For example, we have an apparent need to be 'informed' yet I see that far too much of this 'information' is repetition without confirmation, far too much is reaction (which is not the same as content) and I do not feel informed. Information, in that sense, is different from opinion. I've written about this before, that what I need to know and want to know (and to have known) is not what is being peddled in my direction. We, as a couple, have attempted watching tv news and evening radio this last two weeks; our only common reaction seems to be 'Turn it off'. We are not feeling informed. Whether we feel insulted, or confused or deprived may not be relevant. Headline: "No realistic progress on Brexit yet again. Deadline day now n days away" would be sufficient and, it turns out, would probably have sufficed for most of the last 30 months. n<50 at the moment. As to what we might expect from 5G, please do read the whole of source  — well, look at every page and read some bits at your usual speed. I pick out that there are three parts (what is a part? Well go read and find out, but I'm not even giving you the right term) so that we have eMBB, URLLC and mMTC. Just the middle one of these, ultra reliable low latency communications, is predicted to produce latencies under a millisecond and reliability improvements of something like 8 orders of magnitude. That suggests that we not only have autonomous driving working well, but we would also have telesurgery (more demanding still) and a huge jump in factory automation. Imagine what that same jump will mean for the use of drones; once they're quiet, the skies will be cluttered. Well, they could be; up to the point where someone sees them as good targets, or wants the roads to be back in use. It is almost as likely that we have products purchased but printed at home — but surely that is another generation or two away? SIM card: Subscriber Identity Module. I never knew that. Name three countries that sell all phones unlocked. Oh, okay, try to name just one! Bangladesh, Belgium, Brazil, Canada, Chile, Germany, Hong Kong, India, Iran, Lebanon, Malaysia, Nepal, Norway, Pakistan, Poland, Singapore, South Africa, Thailand. GPRS: General Packet Radio Service, a data standard for 2G and 3G networks. 2G + GPRS = 2.5G, simplistically From the user point of view, GPRS made MMS possible (about 30x faster than SMS. Wi-Fi = Wireless Fidelity. Did you know that? See Internet weather, Essay 131. To find out what standard your phone works to, go to a site such as Phonedog, a cell phone information site. Search the site for the phone you're interested in (literally, put the name in the search field), and look for the specifications (See All Features); what I wanted to know was under General. I wondered if 2G or 3G might be turned off, so that the frequencies might be re-used. This site suggested from several respondents that 3G might well go first in favour of 4G and a better use of spectrum. 2G, the same people thought, might well last past 2025, possibly 2030. What would change that would be an effort to provide complete coverage (in the UK, but the same arguments apply elsewhere). 1 http://b2b.cbsimg.net/downloads/Gilbert/SF_feb2019_5g.pdf This was the article I found first. It explains what 5G is thought to mean in 2019. Of course, that might change when we look back from 2025. If you want to see the immediate future, read this. 2 IMT-2020 http://techblog.comsoc.org/2017/11/26/new-itu-t-standards-for-imt-2020-5g-3gpp-core-network-systems-architecture/ This will lead you to other sources. I hope. 7 https://www.lifewire.com/1g-vs-2g-vs-2-5g-vs-3g-vs-4g-578681 Another listing of NG with descriptions. 11 http://www.efort.com/media_pdf/ARCHITECTURES_EFORT_ENG.pdf a good general background read. Only 6 pages. I did a speed test: latency 22ms, download 22.5Mbps, upload 11.7 Mbps. This is called 'fast'. It causes no problems, so I'd call it sufficient or adequate. A minute later, 17:03, the figures were 20, 9.13, 8.06, 'typical'.